On Sept 21st, 2018 I attended the opening of The Museum of Broken Windows in NYC. I was proud to exhibit alongside Keith Haring and Dread Scott. Even more rewarding was the response to my painting,The Talk. Listening to a white father explain the talk black fathers must have with their sons reminded me of why I paint. I was also fortunate to have the opportunity to speak with the mothers of Eric Garner and Sean Bell at the event. Two very strong women whose stories must be heard. The event was sponsored by the NYCLU as a pop-up experience in New York City, featuring the work of artists from around the country. The Museum, which ran from Sept. 22-30, showcased the ineffectiveness of broken windows policing, which criminalizes our most vulnerable communities. The strategy of broken windows policing is outdated and has never been proven to be effective at reducing crime. For decades, communities of color have been disproportionately impacted by broken windows policing. The broken windows theory is an academic theory proposed by social scientists James Q. Wilson and George Kelling in 1982. The academic theory, which first appeared in The Atlantic Monthly, states that signs of disorder in a neighborhood, like a broken window, encourages petty crimes and leads to more serious crimes. This postulation was adopted by the New York City Police Department and led to the criminalization of poverty and the over-policing of Black and Brown communities at disproportionate rates. The theory has never been proven to be effective at reducing crime. It is time for a change. New Yorkers are coming together for important conversations on policing and what it means to feel and be safe. 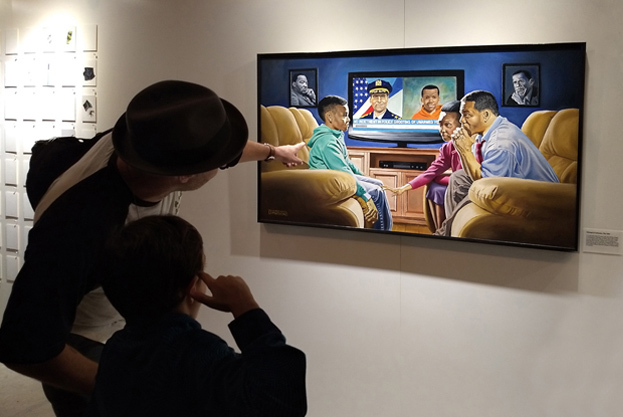 Using art and creativity, the Museum of Broken Windows provided a powerful and emotional experience that critically looks at the system of policing in New York. The Museum of Broken Windows is a project of the New York Civil Liberties Union.